Doesn't our faith have to impact the way we live our daily lives? Do not merely listen to the word, and so deceive yourselves. Do what it says. Anyone who listens to the word but does not do what it says is like someone who looks at his face in a mirror and, after looking at himself, goes away and immediately forgets what he looks like. 25 But whoever looks intently into the perfect law that gives freedom, and continues in it — not forgetting what they have heard, but doing it — they will be blessed in what they do (James 1:22-25). Maybe you've heard the story of a good citizen who was being tailgated by a stressed-out woman on a busy street. Suddenly, the light at the intersection just in front of them turned yellow. The good citizen did the right thing by stopping at the crosswalk — even though he could have beaten the red light by gunning it. 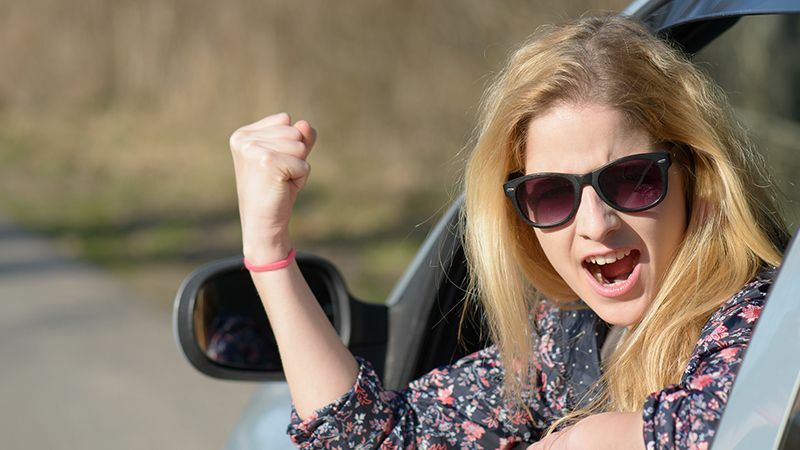 The tailgating woman hit the roof — and her horn. She was screaming in frustration because she had missed her chance to get through the intersection. As she was still in mid-rant — alternately pounding the steering wheel and making an ugly hand gesture to the fellow in front of her — she heard a tap on her window and looked up into the face of a very serious police officer. The officer ordered her to exit her car with hands up. He put handcuffs on her. He took her to the police station, where she was searched, fingerprinted, photographed, and placed in a holding cell. After a couple of hours, a police captain approached the cell and opened the door. The woman was escorted back to the booking desk where the arresting officer was waiting with her personal effects. He said, "I'm very sorry for my mistake. You see, I pulled up behind your car while you were blowing your horn, flipping off the guy in front of you, and cursing a blue streak. Then I noticed the 'Choose Life' license plate holder, the 'What Would Jesus Do?' bumper sticker, the 'Follow Me to Sunday School' bumper sticker, and the chrome-plated Christian fish emblem on the trunk. Naturally, I assumed you had stolen the car." Ouch! Somewhere through the centuries, an idea has gained currency that says we can be Christians in the same way most people are Democrats and Republicans, Rotarians and Lions Club members. We show up for meetings, pay our dues, and wear the insignia. For the most part, however, it is acceptable to be "just like everybody else.” We're devout Christians on Sunday, but we curse or cheat or tell racist jokes the other six and a half days of the week. We have so institutionalized the Christian faith that church membership has come to count for conversion. We have so institutionalized the Christian faith that church membership has come to count for conversion. It isn't just Vito Corleone of "Godfather” fame who could live as a criminal so long as he attended Mass and gave gifts to his church. If one's faith is anything more than self-delusion, it must inform her life in all the routine and ordinary events of life. Even at traffic lights. "Faith's Impact on Normal Life" by Rubel Shelly is licensed under a Creative Commons License. Heartlight encourages you to share this material with others in church bulletins, personal emails, and other non-commercial uses. Please see our Usage Guidelines for more information.